A monument commemorates the centenary of Rugby League(1908 -2008) and the Warialda Wombats. 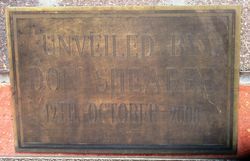 The sculpture by Kerry Cannon was presented to the club in 2004. Rugby League was first played in Warialda in 1920 and this ground was the starting point in the careers of many exceptional players, including Test prop forward Ray Stehr and New South Wales State of Origin forward Stan Jurd. In 2008, the Centenary of Rugby League year, the Warialda Rugby League Football Club was recognised as having made a significant contribution to the ‘greatest game of all’ and in this regard, was identified and selected for its historical importance as a nursery for great Rugby League players. In recognition of this achievement, the club was to be presented with a commemorative plaque. Gwydir Shire Council held a civic reception/dinner acknowledging the monumental achievement in receiving one of a limited number of 1908 – 2008 Centenary of Rugby League plaques. A permanent monument for the Warialda Wombats Rugby League was built and unveiled on 12 October 2008. The monument pavers are inscribed with the winning premiership years, and the smaller pavers have the year and name of the ‘A’ grade coaches commencing from 1947. Gwydir Shire Council staff commenced work on the monument at the Warialda Recreation Ground in August, 2008. The bricks and pavers were laid by volunteer labour from Council employees and local football enthusiasts with special mention to former Mayor Peter Caskey, whose expertise and commitment to detail made this football monument an historical showpiece. In the 1980’s, Ross Earl suggested that the Warialda Rugby League Club have a change of name. As a result, a competition was held and from the entries received the name Warialda Wombats was chosen (even though no one could remember the last time one was seen in the area). The name change also created the opportunity for a logo change. From three sketches submitted by local artist David Moor, one depicting a wombat sitting between the goal posts holding a football was the one chosen, and remains the Club’s logo for promotional material to the present day. In 2003, Kerry Cannon of Ceramic Break Sculpture Park, attended a Club meeting and advised the Committee that he would like to make a bronze statue of the Wombat. He advised that it would take approximately twelve months and when completed he would donate it to the Club. On 25 September 2004, Kerry presented the statue to the Club at a fundraising function being held at the Warialda Royal Hotel. Rugby League was first played in Warialda in 1920 and this ground was the starting point in the careers of many exceptional players, including Test prop Ray Stehr, Test second-rower Noel Cleal and NSW State of Origin forward Stan Jurd.